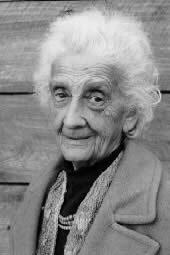 Lotte Jacobi was born in 1896 in Thorn, West Prussia. She worked in the family studio in Berlin from 1927 until 1935, chronicling the culture of the Weimar Republic, portraits of notable German figures in the 1920s and 1930s - people whom the Hitler regime tried to wipe from memory: dancers, actors, playwrights, writers, clowns, celebrities, painters, philosophers, and statesmen. She fled German and established a studio in New York City where she found herself in the company of fellow refugees, including Albert Einstein whom she had photographed in Germany. She made portraits of hundreds of notable people throughout her long life including painter, Marc Chagall, Eleanor Roosevelt, actor Peter Lorre, poets Marianne Moore and Robert Frost, photographer Alfred Stieglitz, writer Thomas Mann, and cellist Pablo Casals. She enjoyed making portraits of ordinary people as well. Her artform was not limited to portraiture. In the 1950s, Jacobi developed abstract photographs, called Photogenics. These images were created without a camera by manipulating light, cellophane, and other materials in the darkroom. The New Hampshire State Council on the Arts awards the Lotte Jacobi Living Treasure Award every two years at the Governors Awards in the Arts. Recipients of the awards are New Hampshire artists in any discipline, who make significant contributions to his/her art form and to the arts community of New Hampshire reflecting lifetime achievement.